It has been too windy and cold since Easter for much gardening. Asparagus crowns, strawberry plants, and a net sack of seed potatoes are all waiting, more patiently than I am, to be planted out. If April showers bring May flowers, then I am hoping April hail and snow really do the trick. While the storms rage, I read up a storm indoors. You Are What You Love: The Spiritual Power of Habit is a new release by James K. A. Smith. I don’t tend to pick up books on Christian discipleship and spiritual formation, or, if I do, my attention wanders well before I’ve turned the final page. Though I haven’t quite finished this one, I’ve begun deliberately slowing my pace. I’m already certain I’ll be reading this a second time and passing it on. Smith’s argument is at once self-evident and astonishing. It brings into sharp focus so many of the dynamics of my own spiritual journey. Descartes said, “I think, therefore I am,” but most of us know, intuitively, that isn’t so. What we think touches only a small, small part of our lives. Love, desire, and worship are much more powerful forces in our lives, and we will never be transformed if we limit Christian discipleship to what we think about doctrine or articles of faith. The difficult but ultimately beautiful truth explored in this book is that we do not always love who and what we think we love. I read the first installment in the Duncan Kinkaid/ Gemma James mystery series, A Share in Death, a long time ago and promptly forgot about it. I enjoyed the story, but I forgot that what I appreciate most in a mystery series is the slow and subtle revelation of the central characters. This means that if I think a series has potential, I should read them in order and read at least the first two or three. I am so glad I recently picked up book two All Shall Be Well. I don’t like the look of mass market paperbacks (perhaps because they all look the same to me? ), but, despite appearances, this is a great series for fans of Louise Penny. Scotland Yard detective Duncan Kinkaid interviews suspects in a London of stewed tea and curry takeaways while Inspector Gamache enjoys tender baguettes in a quaint Quebec village, but I think they have a lot in common. These books are a great way to pass the time until Penny’s newest book comes out in August. Next week I’ll be participating in the Festival of Faith and Writing at Calvin College in Michigan. I’ll be speaking on a panel with Preston Yancey (I’ve heard his latest book Out of the House of Bread is wonderful, and I’ll be reading it myself soon), Addie Zierman (I told you how much I enjoyed her latest memoir, Night Driving), and another wonderful writer Sarah Bessey (her latest is Out of Sorts: Making Peace With An Evolving Faith). I’m looking forward to hearing from some of my favorite writers, including Christian Wiman, Leslie Leyland Fields, Luci Shaw, and George Saunders. I met blogger Anne Bogel at the last Festival of Faith and Writing. If you are looking for a new book to read, I highly recommend her podcast What Should I Read Next? In each episode, Anne talks with a thoughtful reader about three books they love and one book they hate. Based on those titles, she recommends three books to try. I almost always learn about some new-to-me title, and it was a conversation on this podcast that reminded me I’d abandoned the Duncan Kinkaid/Gemma James series too quickly. After a brief hiatus, the Roots and Sky book club is back. Laura Brown asks such thoughtful questions. I hope you’ll check it out, either by offering your own comment or “listening” in. As a bonus, you’ll find several audio recordings of me reading from the book. 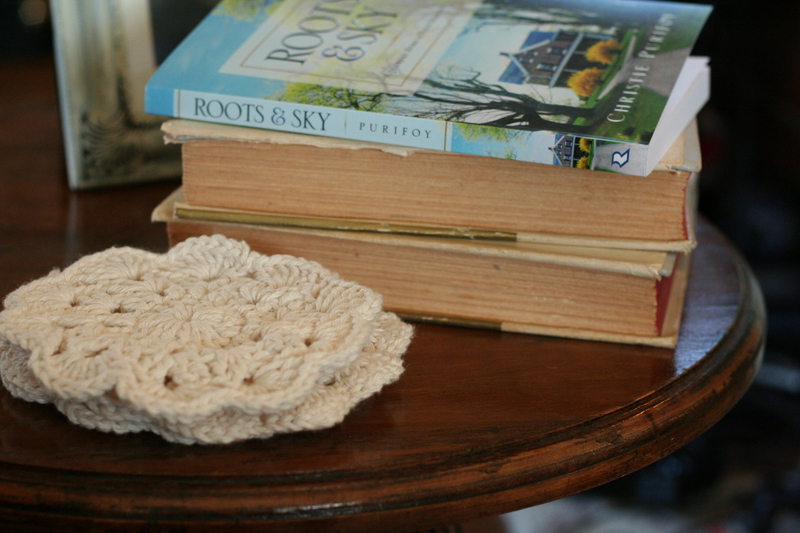 I recently shared a Roots and Sky-themed installment of “These Farmhouse Bookshelves” on writer Rachel McMillan’s website. I have a new piece called “Comfort Food For Those Who Mourn” at Grace Table. It includes a recipe for my family’s favorite dessert. The Festival of Faith and Writing looks so great! I know you told me you went last time. I’ll have to plan to go to the one in two years. Such good stuff to soak up! I love Sarah Bessey’s writing (although I’ve only read her blog). So neat to have a panel with her. Have fun and enjoy your panel. I hope you can go someday. I think you’d love it. There are often visual artists and always writers of children’s books and YA lit. It’s a great event for writers and readers. Thanks for this post, Christie! I wish I could be at the whole Festival of Faith & Writing, but I will only be there on Friday afternoon and evening. I really hope to bump into you! Would love to meet you in person. All of the best for your panel! I’m sure it will be amazing! I’d love to meet! Do you know yet which sessions you’ll attend? I lived in Holland, Michigan for almost nine years. Western Michigan is beautiful most Aprils but weather everywhere has been weird. Usually there are tulips, even in Grand Rapids in April. I’d love to attend that conference with favorite writers. I just started Preston’s book as my nonfiction read after hearing him on the podcast. So far it is very good. I hope you will attend one day! I look forward to it so much and love that it’s a great event for all lovers of literature and the arts. It’s great for readers and writers and those who consider themselves both. I checked the weather forecast – it looks good! Comfort food: bacon, egg, and cheddar on an everything bagel. Thanks for these book recommendations, Christie. I’m investigating the books now.